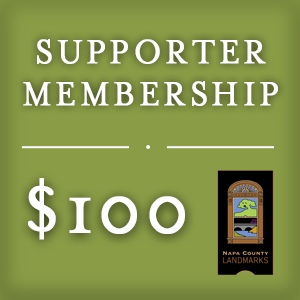 You can support Napa County Landmarks by becoming a member, making a donation, or by becoming a volunteer. As a non-profit organization, we rely on donations and membership dues to fulfill our mission. Join Napa County Landmarks today and start enjoying the benefits of membership, including our quarterly newsletter, invites to members-only events and discounted advance tickets to public events and tours. We gladly accept your support in the form of financial donations. To make a donation of any amount, please contact us. 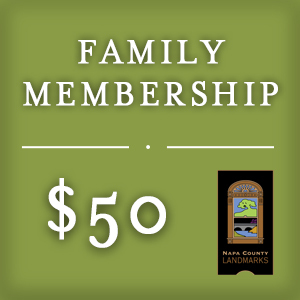 You can purchase a membership online by clicking here, or by calling Napa County Landmarks at 707.255.1836. Napa County Landmarks, Inc. is a 501[c] nonprofit, and membership donations are tax deductible. Quarterly Newsletter. Our newsletter is filled with engaging articles on local historic preservation and inspiring stories about how committed individuals are making a difference in our community. Special Event and Program discounts designed to help you better experience beautiful Napa County and the cities and towns that make this place such a spectacular place to live and visit. Discounts on certain programs and events including our popular Holiday Candlelight Tour. Special Invites to Member Events such as Awards of Merit and participation in Board Member nominations.